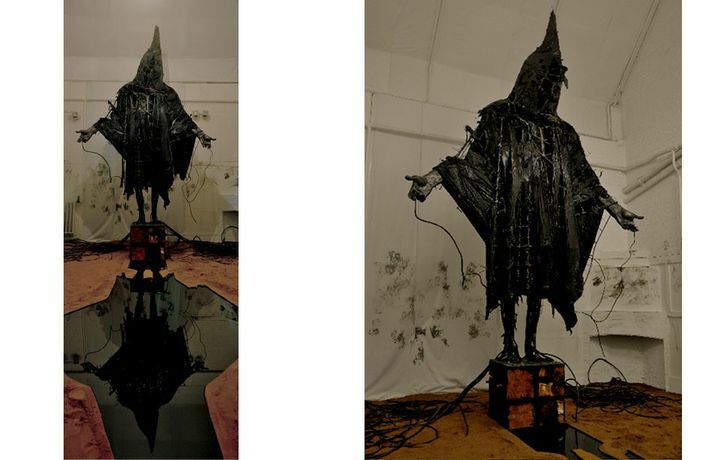 Casting a Dark Democracy represents the culmination of a body of work by sculptor Tim Shaw, to be shown for the first time at the Kenneth Armitage Foundation this autumn 2008. In 2007 Tim Shaw was awarded the Kenneth Armitage Fellowship, which has enabled him to live and work in the late sculptor's studio residence in Kensington.This exhibition confronts issues of world conflict, particularly with the atrocities that have framed our reception of the war in Iraq. A major installation standing five metres in height is based on the now infamous image of the Abu Ghraib prisoner. Other works in the exhibition will include Man on Fire (2007-8) and Tank on Fire (2007-8). Tank on Fire has just won the Selectors' Choice award at the Threadneedle Figurative Prize.